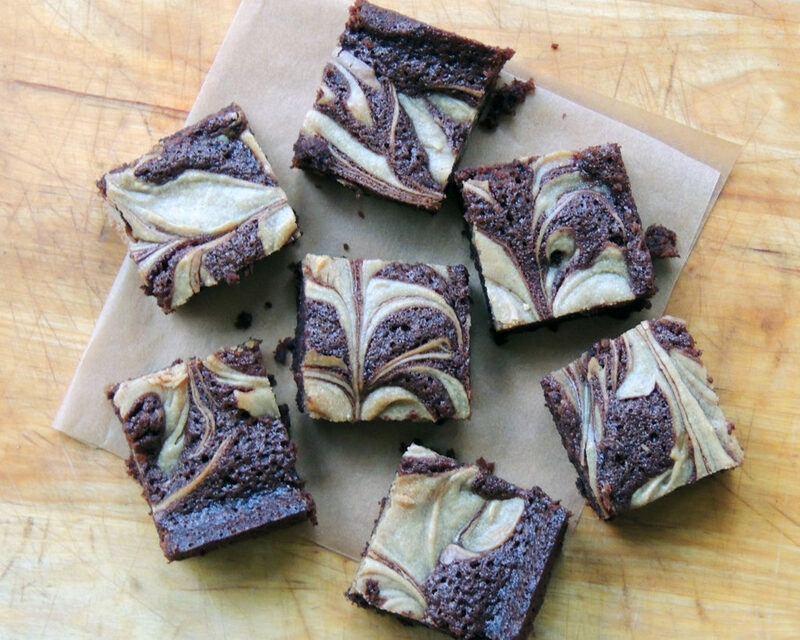 In a brownie kind of mood? 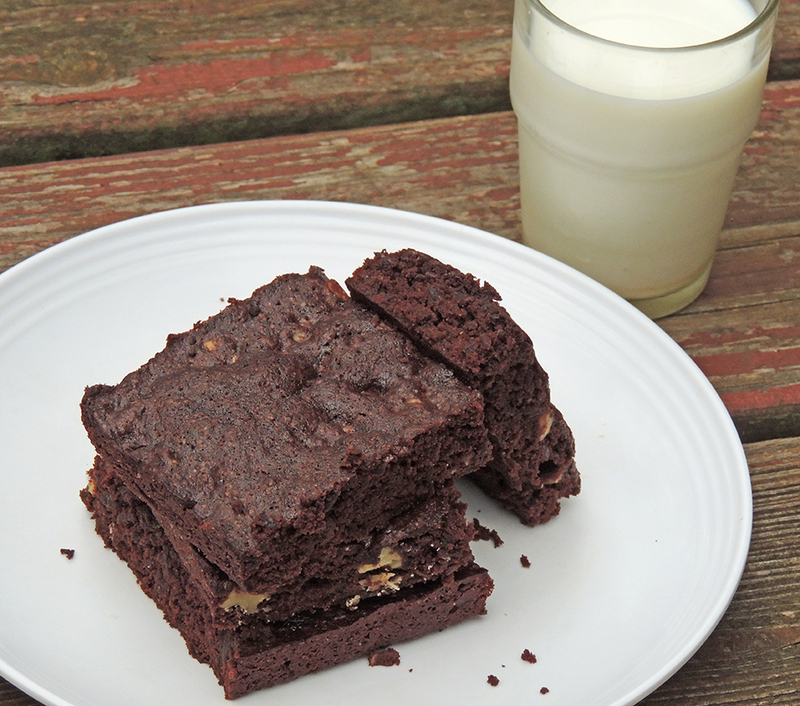 Try one of our easy brownie recipes…. Heat oven to 350F°. Butter and flour a 12 x 18 x 1-inch baking pan. Melt together the butter, 1 lb chocolate chips, and the unsweetened chocolate in a medium bowl over simmering water. Cool slightly. In a large bowl, stir together the eggs, espresso granules, vanilla, and sugar. Stir the warm chocolate mixture into the egg mixture and cool to room temperature. In a medium bowl, whisk together 1 cup of flour, baking powder, and salt. Add to the cooled chocolate mixture. Toss the walnuts and 12 oz of chocolate chips in a medium bowl with 1/4 cup of flour, then add them to the chocolate batter. Pour into the baking sheet. Bake for 35 minutes. Don’t overbake. Cool thoroughly, refrigerate, and cut into squares. Place pecans in food processor and process until small and crumbly. Dump the mixture into a brownie dish or small cake pan and press down firmly using your clean hands. Refrigerate to chill an hour or so to firm up. Frost with raw chocolate icing if desired. Heat oven to 350°F. Grease a 9″ square baking pan. For the brownie batter: Heat the butter over low heat in a heavy saucepan until melted. Stir in the sugar and vanilla. Add the eggs one at a time, beating well after each addition. Add the cocoa; beat well until well blended. Add the flour, baking powder and salt; beat well. For the peanut butter mixture: Beat together the cream cheese, eggs, sugar, salt and vanilla. Add the peanut butter and mix until smooth. Drop dollops of the peanut butter cream cheese mixture over the top of the brownie batter. Using a knife, gently swirl the peanut butter cream cheese mixture into the brownie batter until you have a nice looking pattern. Try to swirl into the corners and edges of the pan. Bake for 35 – 40 minutes, or until a toothpick inserted in the center comes out clean. Heat oven to 350°F and grease a 9 x 9 baking pan. Combine almond butter and honey in a bowl. Beat in the egg and vanilla. Stir in zucchini. Sift in the cocoa, cinnamon, and baking soda and mix well. Stir in chocolate chips. Pour into prepared baking pan and bake for 30-35 minutes or until a toothpick comes out clean. Heat the oven to 350°F. Spray a 8 x 8-inch baking pan with nonstick cooking spray. Spread batter evenly in prepared pan. Bake until brownies are set in the center, 25 – 30 minutes. Let cool before cutting. Heat oven to 325°F. Spray an 8-inch square baking pan with cooking spray. Melt butter and chocolate together in a heavy-bottomed saucepan over medium-low heat, stirring until smooth. Remove from heat, and stir in remaining ingredients. Pour batter into pan. Bake until a toothpick inserted into center comes out with moist crumbs, about 35 minutes. Let cool completely. Heat the oven to 350°F. Lightly oil an 8-inch square baking pan. In a large bowl, mix the flour, cocoa, salt and baking soda, crushing any lumps of cocoa with the back of your spoon. In a food processor, puree the avocado until completely smooth. Add the white and brown sugars and process, then add the eggs, oil or butter and vanilla and process until smooth. Scrape the avocado mixture into the flour mixture and stir to combine. Spread the batter in the prepared pan. Bake for 20-25 minutes, until the top looks dry and a toothpick inserted in the middle of the pan comes out with big wet crumbs attached-not dry. 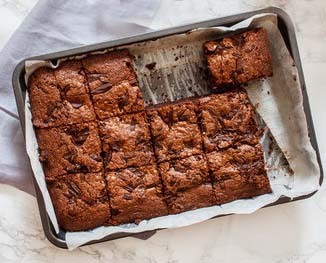 Don’t overbake, if you like a gooey brownie, take it out while a little gooey in the middle and chill to make it easier to cut. Cut into 16 squares and serve. Heat oven to 375°F. Spray a 9 x 13 pan with cooking spray. Trim stems off beets, and wash off dirt. Drizzle olive oil over beets. Wrap loosely in foil and place on a sturdy baking sheet. Roast 45-55 minutes, until tender when pierced with a fork. Remove from oven and let beets cool 10-15 minutes. Peel and cut into chunks. Place beet chunks and applesauce in a food processor, fitted with a metal blade. Pulse until smooth. Beat sugar, oil and eggs together in a large mixing bowl. Add cocoa powder and beet mixture. Mix well. Sift together flour, baking soda and salt. Gradually mix into batter until no clumps of flour show. Do not overmix. Stir in half of the chocolate chips. Pour into prepared pan. Bake 40 minutes. Sprinkle with chocolate chips. Bake another 5 minutes or until a toothpick inserted in center comes out clean.